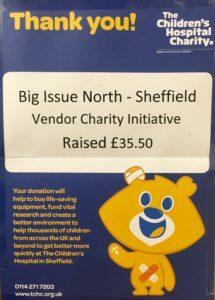 Sam, a former Big Issue North vendor, has coordinated a collection from vendors in the city for Sheffield Children’s Hospital and Charity. He recently met staff at the hospital to present them with the funds raised by vendors, which will go towards Giggle Doctors, who entertain children on a weekly basis! Sam said that he chose this charity as he is keen to raise awareness of it. He is also aware that local people support vendors, and feels it’s important to give something back to the local community, which is why he set up this idea. If you would like to support us to facilitate vendor meetings, resulting in local charity initiatives like the one featured above, please donate to our JustGiving page today.